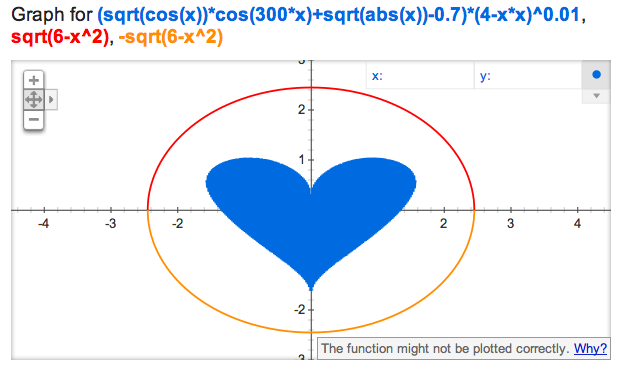 Google can create a mathematics based heart shape for your beloved Valentine. Google search can actually plot any mathematics equation on a graph. Impress your love! On this Valentine, do you want to express your love in style? Well, there is a great idea from none other than Google! You can send your beloved a shape of heart created by plotting a graph with a mathematical formula. You may not be aware of it, but Google search engine has a number of lesser known features. One of these features is that Google can plot a graph if you enter a maths function in search. The trick of mathematics heart is based on this feature. So, how to do this? Let’s see! When you enter a mathematical equation in Google search engine, it tries to plot the equation in the form of a graph. The following equation, produces the image of a heart when plotted on X and Y axes! When your beloved Valentine will click on this link, it will open Google search results and the following shape of heart will get plotted. You may want to know that this trick is not something special offered by Google as such. Google plots any equation –so it is possible to create other shapes as well if you are a maths genius! Would not you want to give it a try?! Please let me know how you liked this little trick. And of course, as always, feel free to ask me if you face any problem. Thank you for using TechWelkin.